Adam Parsons thinks he knows exactly what he wants out of life. Working as a farrier in 18th century England does little to satisfy him. 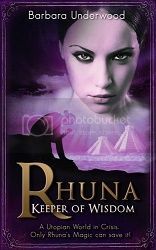 A dark ship comes into port and a sudden opportunity arises to change life for himself and his love, Selena. Will Adam find what he truly desires or will he lose all that he already has? What will it take for Adam to find all that he desires? Goodson definitely doesn`t disappoint with this short story. She definitely keeps her writing at the top with the very well written short story. I absolutely love Goodson`s descriptions and the flow of her writing. Everything is so well written and pieced together in such a natural way that you can`t help but immerse yourself in the world that she creates. This short story also has such real possibilities in events that have occurred in human history that the realism is unmistakable. The characters in this novel are such real entities that you can`t help but love (or hate) them. Although character development in short stories is, by definition, minimal, Goodson presents everyone in such a manner that you can see where they are coming from and what sparks their actions. She also presents them in such a light that your imagination easily fills in any blanks that may be left. As a whole, this is definitely one of the best short singles that I`ve read in a very long while. With it, Goodson remains at the top of my favourite authors pile, outshining many mass produced authors on today`s market.